Reicker Pfau partners Michael Pfau and Robert Forouzandeh represented AutoCamp in its recent Strategic Partnership Deal with Whitman Peterson. AutoCamp, the leading outdoor hotel brand, announced today that it has closed on a strategic capital partnership deal and secured $115M in equity commitments to fund a rapid national expansion. The deal, which provides for a follow-on equity commitment that will double the investment capacity, was led by Whitman Peterson, with advisory services provided by RobertDouglas. The announcement follows last month’s news that AutoCamp will purchase hundreds of additional custom trailers under a territory exclusive deal with the iconic Airstream RV brand. AutoCamp has established itself as the leading outdoor hotel brand by creating a modern and stylish outdoor lodging experience that makes it easy for people to reconnect with the great outdoors and each other. The company specializes in design-forward, proprietary Airstream suites and tent accommodations accentuated by mid-century modern inspired guest facilities in iconic locations. The investment supports AutoCamp’s aggressive near-term national expansion plan that includes California and the East Coast, as well as other iconic outdoor travel destinations across North America. With properties in Santa Barbara and Napa/Sonoma Wine Country, the company will open its newest location in May 2019 near Yosemite National Park, which will feature more than 100 luxurious custom Airstreams, tents, ADA suites, and other accommodations. “Our vision is to connect more people with the great outdoors and each other with welcoming hospitality and beautiful design. We have built a strong brand and assembled an executive team of industry experts in hotel design, operations, and outdoor recreation,” said Neil Dipaola, CEO and Founder of AutoCamp. “Whitman Peterson is the perfect strategic partner for AutoCamp. With vast experience in real estate and hospitality, the team will help us rapidly execute on our plan to identify and build out a substantial number of properties in the coming years,” continued Chris Haydon, CFO and Partner. AutoCamp continues to lead and innovate in the global hospitality market providing a hassle-free outdoor experience that has become wildly popular with millennials and other travelers looking for unique, experiential travel. Skift reports that the demand for experiential travel shows no signs of slowing down. According to Inc., travel and tourism was a $1.5 trillion industry in 2018 and is projected to grow to $2.4 trillion by 2028, while the Outdoor Industry Association reports that North American consumers spent $887 billion in 2017 . Millennials are leading the pack in this market and have become the largest generation of travelers, representing $50 billion worth of travel spending in the U.S. alone. In addition to RobertDouglas advising on the capital raise, legal teams assisting with the investment include Goodwin Procter, Reicker, Pfau, Pyle & McRoy, and Jones Day. The company also recently announced a team of Advisory Board members including Chip Conley, Founder and former CEO of Joie de Vivre Hospitality, and former Head of Global Hospitality & Strategy at Airbnb. Mike Depatie, Managing Partner at KHP Capital Partners and former President and CEO of Kimpton Hotels & Restaurants, as well as Shane Ott, former President and COO of Kampgrounds of America (KOA) have also joined the Advisory Board. AutoCamp, the leading outdoor lodging brand, makes it easy for people to connect with the great outdoors by providing modern and stylish accommodations. 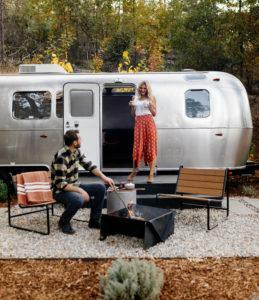 The company’s unique properties are known for beautiful modern Airstream suites, and luxurious tents. AutoCamp has revolutionized alternative lodging by blending the traditional outdoor experience with the service and design of a boutique hotel. From luxury linens, bedding, and bathrobes to a mid-century modern inspired reception and meeting space, AutoCamp has reimagined the outdoor lodging experience for the modern adventurer. Visit AutoCamp in Santa Barbara; the Russian River Valley; and soon to be open at Yosemite near Mariposa, California. For more information and booking visit autocamp.com. Whitman Peterson (“WP”) is an institutionally backed real estate investment management company actively investing in the hospitality, multifamily, student and seniors housing sectors. Through its discretionary commingled funds, WP has invested in transactions involving more than 150 acquisition and development assets, with an aggregate capitalization of over $15 billion. The firm has investments across 30+ submarkets in the U.S. and also has investments in the U.K. and Latin America. Whitman Peterson focuses on helping drive significant asset and operating company growth to a select group of prominent national operating, investment, and development companies within WP’s target sectors. To learn more about Whitman Peterson, visit WhitmanPeterson.com.